"... we need to be strong and not lose hope and faith and humanity in each other and provide that support system." 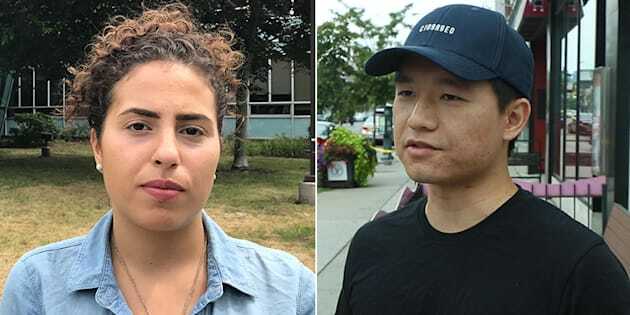 Suzanne Kanso and Milton Kong live and work in Toronto's Greektown neighbourhood. UPDATE - July 24:Police have identified Julianna Kozis, of Markham, Ont., as the 10-year-old child who was killed. TORONTO — Ask people in Toronto's Greektown to describe their neighbourhood and you're bound to get similar portraits. It's a family neighbourhood. The shops are independent, unique. The pets are as cute as they get. Kids play outside on sidewalks and playgrounds. But for most of Monday, the bustling area had come to a standstill. Police had blocked traffic on Danforth Avenue for several blocks from Broadview to Pape avenues, home to many shops, patios, bars and restaurants. Milton Kong was at one of those establishments, Messini's, on Sunday night when he heard a "couple of loud pops." "At first we didn't know what it was ... Then I saw a couple of people run in to the store from the street and then someone yelled, 'Those are gunshots!'" Milton Kong was having dinner at a restaurant when he heard loud "pop" noises. He was just steps away from Logan Avenue — the epicentre of a mass shooting that would end with the deaths of a 10-year-old girl, 18-year-old Reese Fallon, who had just graduated from high school and was planning on attending McMaster University, and suspected gunman, Faisal Hussain. "I feel horrible for all those families. [It's] terrible for the business owners and the community. It's horrible," said Russ Martin, a 30-year-old writer who's been living in the east Toronto area for four years. "It's really sad," said Kong. "This area is such a nice area for families or just going out for a stroll on a nice evening, having great food." Kong was waiting for his car to be released from the crime scene since the street was closed to the public. Suzanne Kanso, who works and lives in the Greektown neighbourhood, says the community has always felt safe. Suzanne Kanso lives and works in the neighbourhood as director of community storytelling at Centennial College's art centre on Carlaw Avenue, about a 10-minute walk from the site of the shooting. She was in a car with a friend close to the scene of the shooting when, like Kong, she heard a "pop." "That could have been us," Kanso said of the victims. "We were just out the night before, having dinner and having a good time. It's the weekend. The thought that you could have been that person does not flee your mind." But as she processes the grief and shock of the shooting, she's confident in how Greektown would move forward: it'll unite and come out on top. "Honestly, we're trying to say not only [are we] Toronto Strong, but Danforth Strong, because we need to be strong and not lose hope and faith and humanity in each other and provide that support system," said Kanso. People have left messages on a chalkboard in a parkette in Toronto's Greektown. Through the fear and uncertainty of a fresh tragedy, many are adamant that the violence will not change the neighbourhood. "There's a lot of connective tissue in the neighbourhood. It feels more like a small-town vibe than a large urban centre. We're not going to lose that neighbourhood feel, but it's terrifying," admitted Martin about the shooting. Theresa Miedema, a professor at the University of Ontario Institute of Technology, doesn't live in Greektown, but she was determined to visit the neighbourhood on Monday. "Why did I come out today? I suppose mostly to support the businesses and to support our city, to support this part of the city." A Toronto police vehicle blocks access to Danforth Avenue, where a mass shooting killed two victims and injured 13 others. The gunman is also dead. Miedama said one of the most difficult parts of the "devastating" shooting was that it involved a child — and it's not even the first this summer. Last month, two girls playing in a Scarborough playground were shot, when a suspect opened fire at a man in the park, who was believed to be the intended target. Miedama hopes the city can push through these tragedies with patience and calm. "I think as a city we have to resist the urge to blame people without knowing what's going on," she said. Theresa Miedema, a professor at the University of Ontario Institute of Technology, said she was in the Greektown neighbourhood to support the community and its businesses. "We need to keep this a city, a community, and that means fighting to keep civic spaces civic and civil, and places where you can just come out and be free and have fun with your family. But that's going to take an effort, right now, for us." She called on people from outside Greektown to join her. "Come on out and show that we are a community of communities and that we have each other's back. We're stronger together. Don't be afraid. Come out, bring your family and make sure that we keep public spaces happy and open for the public."